Bilka is also great at helping people out on the Factorio discord. Many props to him. Well done Gangsir also of course! Does there exist a public link to this Factorio discord? 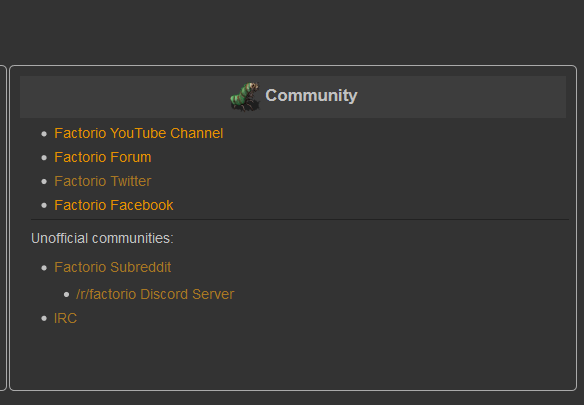 taikodragon wrote: Does there exist a public link to this Factorio discord? Ok, this is just too cool. Start off as a volunteer doing something you enjoy, then win the lottery and get picked up as an employee for said enjoyment. Nicely done Bilka, keep up the great work. I use the wiki all the time. As soon as I saw the new concrete addition, I started searching for it on the wiki, and was impressed to find it there so quickly. Props!! Hey, about the T-shirts... im a big guy, and typlically wear 4XLT T-shirts. i know the store doesnt offer these, but is there any way to special order them through your producer? i understand it may be a bit expensive, but honestly, i would be willing to pay $35for a proper size shirt. Now all he needs is an upgrade from Filter Inserter. Forum staff not as fast? Im am not your rolling wheel, I am the highway! should be your focus - finally. Congrats @Bilka ! I'm too new in the community for knowing the older wiki, but for sure, the actual one rocks ! Together with scripts, templates allow us to partially automate updating the wiki to the newest version, and alongside access to the game's source code, it is possible for me to update the wiki to a new version within a few minutes. Congrats on the new job @Bilka.